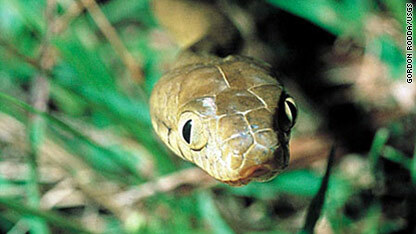 The USDA says brown tree snakes have wiped out Guam’s native populations of forest birds. Dead mice packed with acetaminophen, strapped to pieces of cardboard and dropped from helicopters may help control one of the big headaches for the Pacific island of Guam – the brown tree snake. The U.S. Department of Agriculture last week began dropping the expired rodents packed with 80 mg of the generic equivalent of Tylenol on the forests of Naval Base Guam. Since scientists discovered that the household pain reliever was deadly to the brown tree snakes, they’ve been trying to figure out how to get it to where many of the serpents live in the canopies of the island’s forests, according to a report in Stars & Stripes. The Tylenol-loaded mice are attached to two pieces of cardboard joined by paper streamers that snake exterminators hope will catch on tree branches, providing deadly snacks for snakes at those heights, according to the Stripes report. The aerial attack on the tree snakes is designed to augment current trapping systems, which are placed around ports and airports to prevent the snakes from hitching rides to other Pacific islands such as Hawaii and causing the same ecological nightmares they’ve been responsible for on Guam. "The brown tree snake traps that you see around Guam are actually the most effective trap for catching snakes in the world," USDA Assistant State Director Dan Vice told Guam Newswatch. "Most of the traps that people see however are sitting on a fence or on a port. And they're targeting the few snakes that might get to that fence." So the mouse bombs have begun falling on the jungle forests, where the USDA says there can be as many as 20 brown tree snakes per acre, one of the highest snake densities recorded anywhere in the world. The USDA says brown tree snakes have wiped out Guam’s native populations of forest birds since being accidentally introduced to the island half a century ago, probably after they stowed away on a ship or plane from their native range in Australia, Papua New Guinea and the Solomon Islands. And because there are no native predators on Guam, officials say poisoning the snakes is the only way to control the population. The snakes take an economic toll, too, becoming entangled in overhead electrical wires and causing power outages which cost the island millions of dollars in repairs and lost work. If the current the experiment works – scientists will know because they’re also packing the dead mice with radio transmitters for the snakes to ingest – death from above will be coming for snakes at the island’s Anderson Air Base next year, according to Guam Newswatch. Success there could see the program expand island-wide. I wonder if the helicopter pilot gets combat pay for flying this mission in the "war on snakes"? He/she should at least get hazard pay... can't imagine the stench of 40,000 dead mice! Can't help but to have this weird vision in my head of mice paratrooping down w/ machine guns blazing, trying to protect themselves from the snakes. LOL!! That could make a great movie! Coming from a fellow snake owner, it is abuslotely﻿ unnecessary to take a live animal and traumatize it more they what need be. Mice die fairly quick when constricted. And that snake does not need extra calcuim. Nor is it life to RECORD an animal dying, whatever the case may be. Mice deserve respect because they are what keep your snake alive. How would they prevent cats from consuming the tylenol packed mice? What has been the results of dropping the tylenol nice? I have not been able to find any information on this.